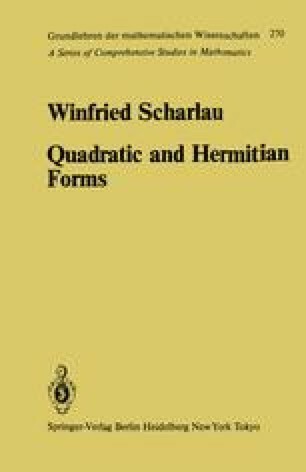 The definitions of symmetric bilinear forms and quadratic forms which appear in chapter 1 and are basic to the following chapters can be generalized. As already indicated in chapter 1 one can replace the ground field by an arbitrary commutative ring. In this case it is appropriate to define forms on finitely generated projective modules. However even the commutativity of the ground ring need not be assumed. Instead one can consider an associative ring with an involution and forms that are hermitian with respect to this involution. These hermitian forms are generalizations of symmetric bilinear forms. It turns out that generalizations of quadratic forms can also be defined in this context. This requires some technical preparation. But even this definition is still not general enough to encompass all concrete examples that we are interested in. For example, the forms on torsion modules considered in chapters 5 and 6 do not fit into this framework.